October 2015: Tips, eNews, and more! It's no wonder autumn is the favourite season of many in our office. The morning air is crisp but not cold, it's getting dark earlier but not before dinner, and comfy sweaters and scarves can come out of the closet but there's no need for winter jackets just yet! Halloween falls on a Saturday, so ghosts and goblins will be out early and all through the night. Be careful as you drive through your neighbourhood. As always, with Thanksgiving and Halloween kicking off the holiday season, remember not to overindulge too early and avoid binging too much. Even scarier than Halloween is the approaching cold and flu season. October is Influenza Immunization Awareness Month. The flu is highly contagious and the severity of its effects can differ vastly between individuals. Whether you choose to get vaccinated or not, you can help stop the spread of the flu by avoiding people who are sick, properly covering your mouth and nose when you cough or sneeze, washing your hands frequently, not touching your face, and - most importantly - staying home when you are sick! Is your dental insurance plan based on the calendar year? If so, your coverage maximums start over on January 1st, and your unused benefits may not roll over into the New Year. That means if you don't use them, you lose them! If we haven't seen your smile in a while, be sure to schedule an appointment today. "Brush your teeth... round and round" we all remember the song. It's amazing, though, how many people still use improper brushing techniques. Brushing your teeth properly with a good tooth brush is your best line of defense against cavity-causing plaque between dental visits. Improper brushing can be just as, if not more, harmful than plaque itself. Brushing too hard or using an improper tooth brush can erode enamel on the sides and tops of your teeth as well as damage your gums. Don't be discouraged though, proper brushing technique is easy and rewarding. It is recommended that you brush your teeth after every meal, and especially before your go to sleep, as bacteria will remain unchallenged for an extended period while you sleep. What a beautiful time of year! The leaves are colourful, apple picking is giving way to pumpkin season and warming spices such as cinnamon, nutmeg, and ginger capture our senses. But let's face it, sugar is what makes October so popular! If you need to satisfy your sweet tooth, there are countless alternatives to the empty calorie treats October is renowned for. 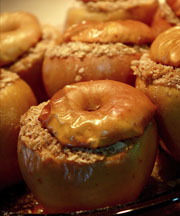 This month we are featuring a delicious fall recipe for cinnamon baked apples! They are naturally sweet, full of fibre and can be quite visually appealing when topped with maple syrup, raisins and some nuts.